Last week we received the sad news that former Suresearch member Sohan Soroya passed away on 7th January 2018. We send our condolences to his family. In the weeks leading up to his death, Sohan sent us some of his wonderful, evocative poetry for publication on the website. His poems were published in the Creative resources/poetry section of the website in December 2017. 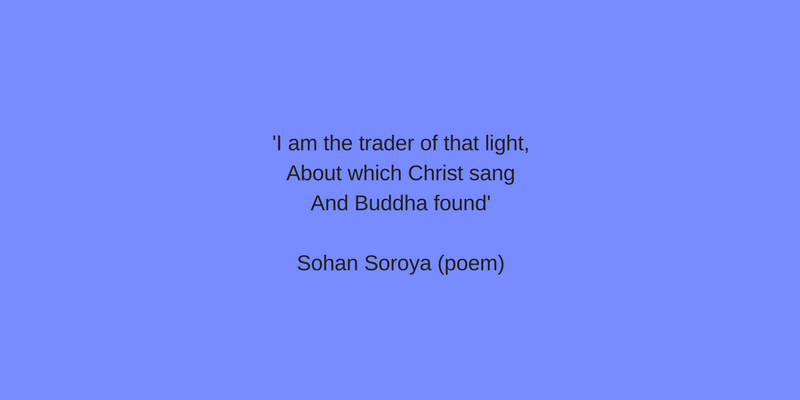 Sohan’s poetry conveys the light of a Universal Truth that goes beyond the boundaries of different religious and cultural traditions, yet embraces and unites them all. His experience of light is also a discovery of hope, a hope born of compassionate connection. As a conscious poet he was also a true activist in the world, for ‘to hear God’s word’ is to do it. These words perhaps reflect the essence of Sohan’s own dynamic poetry and spiritual journey. We are grateful that he gave us the gift of his poems, before he passed away. The poems can be viewed here.